A dozen years ago, we created a graph database because we needed it. We focused on performance, reliability and scalability, cementing a foundation for graph databases with the 0.x series, then expanding the features with the 1.x series. Today, we announce the first of the 2.x series of Neo4j and a commitment to take graph databases further to the mainstream. Neo4j 2.0 has been brewing since early 2013, with almost a year of intense engineering effort producing the most significant change to graph databases since the term was invented. 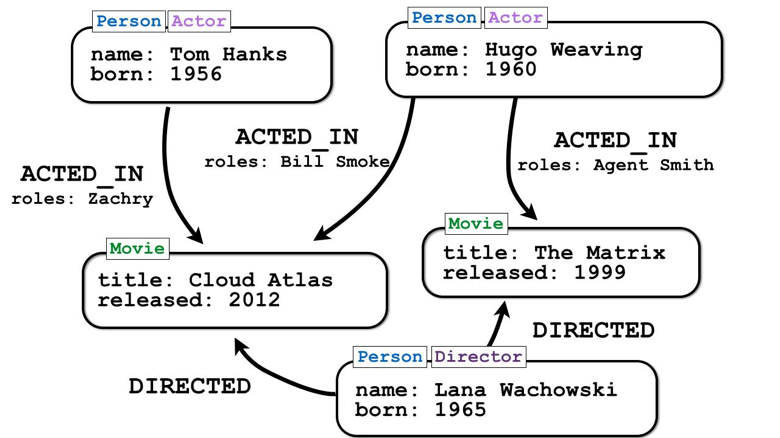 What makes this version of Neo4j so special? 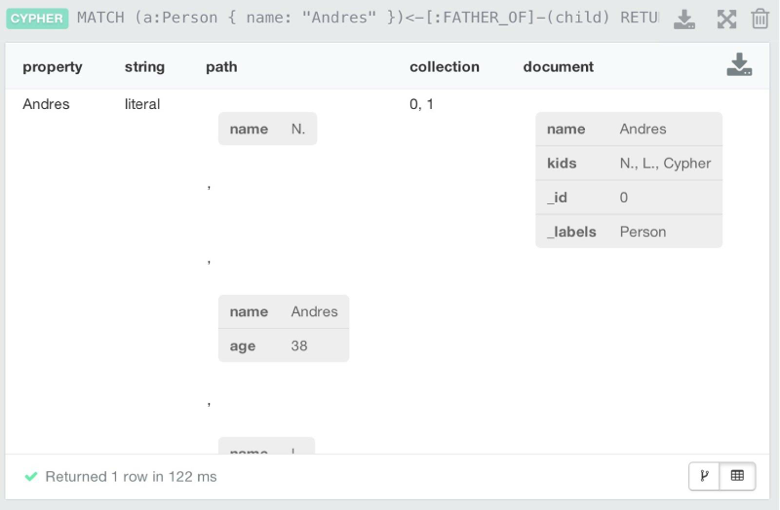 Two things: the power of a purpose-built graph query language, and a tool designed to let that language flow from your fingertips. Neo4j 2.0 is the graph database we dreamed about over a dozen years ago. And it’s available today! We paid careful attention to how you work with Neo4j, from learning about graphs, to initial experimentation, and finally developing your own applications. Then, we completely rewrote our user interface to create the Neo4j Browser as a fluid developer workbench. We think you’ll love the clean UI, with helpful guides, reference topics and even a mini graph app about Movies and Actors to help you get started. Once you experience the powerful combination of a multiline Cypher query editor with insightful visualizations, tabular representations, drag-and-drop support and export features, we’re confident it’ll become your daily companion. What began as a convention for describing graphs in email has become a natural way to “think in graph” — Cypher, a graph query language. 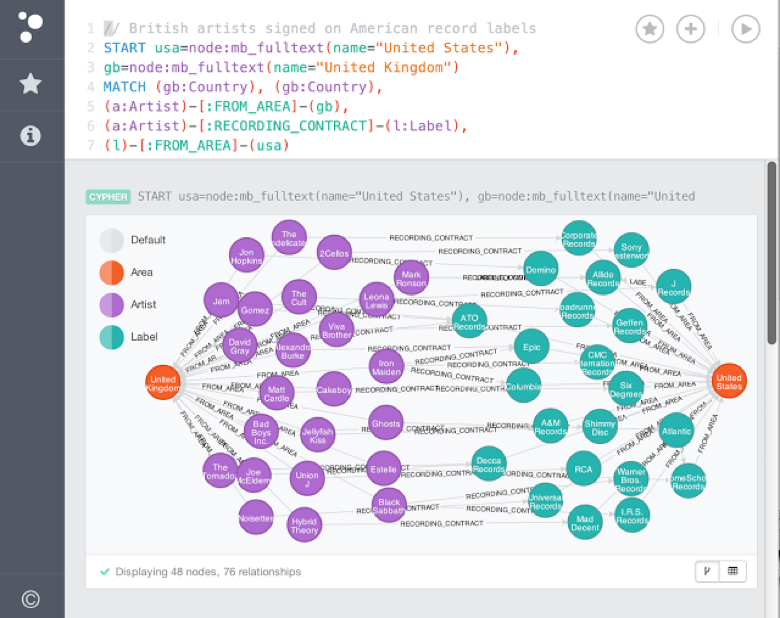 With Neo4j 2.0, we’ve discussed and considered, and argued our way to a more complete Cypher. It has even influenced the graph model itself. Early on, it became apparent that we needed a way for Cypher to refer to subsets of nodes in a graph. So for the first time since 2002, we changed the graph model, adding the concept of a node label. Labels simply mark a node as belonging to a group. They’re optional, and you can have as many labels on each node as you’d like. A graph model with labels. “Wait, what?! ?” we hear you say. Schema in a NOSQL database? It’s not like returning to relational schemas, rather being able to provide some additional meta-information to make your queries run better and keeping your data more consistent. This ensures that you won’t be able to create a second Person node with the same name property value. Such a query would fail. When any part of a pattern isn’t required, extend a MATCH with an OPTIONAL MATCH . Everything in the required MATCH pattern must be found, but the optional part may be missing and will return a null. Because ‘n’ is in both matches, it is mandatory, but ‘r’ may be null so ‘n’ doesn’t have to have a relationship to be included in the result. Make sense? Larger patterns with relationships can also be MERGE’d. As with a single node pattern, it’s all or nothing – the entire pattern is found, or it is created. This clause is provisional; we expect it to be enhanced and refined based on how you use it. Let us know. Join us for a special ” What’s new in Neo4j 2.0 ” webinar. Of course the Neo4j Manual has been updated to reflect all the changes and the Cypher Reference card too. Lovingly refined since we began, Neo4j has become an awesome tool used by graph pioneers around the world for a stunning diversity of projects . Today, centuries of graph theory can be yours with just a few simple lines of Cypher. Neo4j 2.0 claims the awesome power of graphs away from academia, sneaking past the hackers, delivering a graph database that anyone can use. This is just the beginning. We have graphs for everyone. We are extremely excited about this Neo4j release and really want your feedback, comments and contributions to our beloved graph database project and its wonderful community. Enjoy Neo4j 2.0, and Happy Coding and Happy Holidays! Awesome news! Are the sample datasets available for both 1.9 and 2.0? hi,<br /><br />Have you addressed the clustering(scaling) issues in this release ? last thing I read a while back was there were some problems with scaling, so what&#39;s the news with that ? also a small tip please pick another blogging platform other than blogger commenting here was unpleasant experience, or at least use Disqus. Great stuff! Can Michael Hunger shed some light on when spring-data-neo4j will follow? What about Neo Spatial ? It is updated for Neo 2.0 GA ?